The Labor Day tradition began shortly after 11 a.m. under heavy security to prevent the type of violence that has overshadowed the parade in past years. The vibrant and iridescent spectacle of wildly-costumed revelry amid steel drum music returned to the streets of Crown Heights Monday for the annual West Indian Day Parade. 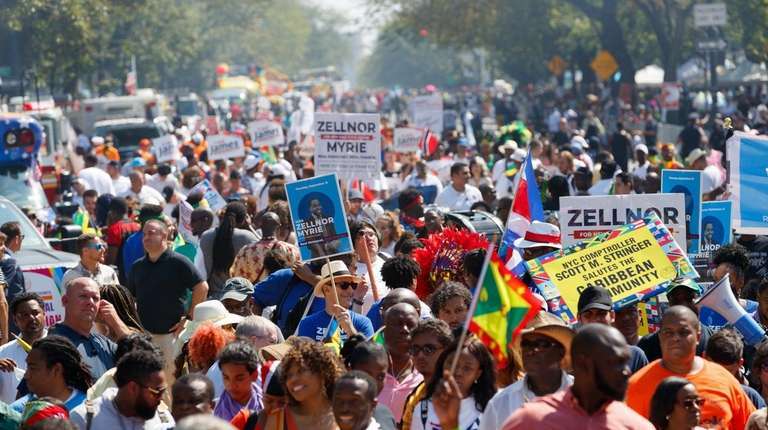 The Labor Day tradition, one of North America's largest Caribbean carnival celebrations, began shortly after 11 a.m. under heavy security to prevent the type of violence that has overshadowed the parade in past years. “I’m ready to go," said Paul Payne of Boerum Hill, a sergeant with NYPD's school safety unit as he sat on the steps of the Brooklyn Library Monday playing a guiro, a Latin American percussion instrument. "I’m ready to party." Payne, who grew up in Crown Heights, said the parade has always been a major part of his life. Payne's wife, Doris, said the event attracts huge crowds from Brooklyn and beyond. 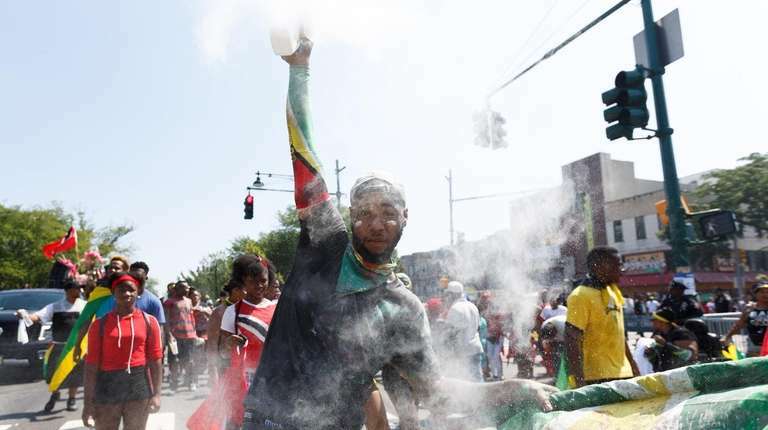 The seven-hour event began early Monday morning with the J'Ouvert festival featuring steel pan bands and marchers covered in paint or oil throwing talcum powder into the air. The significantly larger parade itself, held along Brooklyn's Eastern Parkway, featured dozens of bands and elaborately costumed revelers riding on brightly decorated floats. The festivities, organized by the West Indian American Day Carnival Association, have origins dating to Harlem in the 1940s and typically attracts nearly one million people throughout the day. 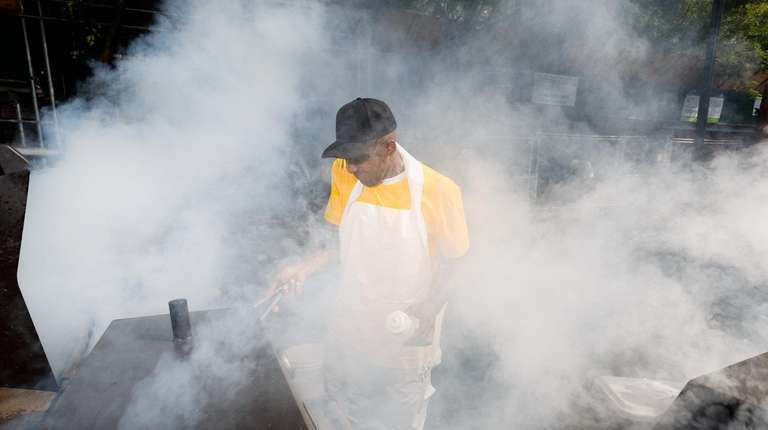 Vendors hawked African clothing and colorful Caribbean country flags along the parade routes while the aroma of jerk chicken, chicken curry, corn soup and macaroni pie filled the air. Karen Harris of Bedford-Stuyvesant, working the food stall at Sherm’s, across from the Brooklyn Museum, said the day is a celebration. Herman Longsworth, 52, general consul at the Consulate General of Belize in Manhattan, stood along the parade route wearing a “Belize” hat. “It certainly is a day for the cultural pride of the Caribbean," Longsworth said. "You’ll see a lot of people showing their colors." Aly Gueye of Manhattan, an immigrant from Senegal, had a booth along Eastern Parkway selling flags with his 15 year old son Abdoulaye. “I love to see all the cultures coming together," he said. "I love to see all the people coming together, the black people, the white people, the African people, the Caribbean people." Security was tight as promised, with dozens of officers stationed at the route’s intersection at Franklin Avenue alone. Helicopters flew intermittently overhead. A man was shot Monday morning six blocks away from the festival, police reported. The man, 25, was shot once in the lower back after an argument with the unidentified suspect, who remained at large, the NYPD said. Police have not determined whether the shooting was related to J'Ouvert. 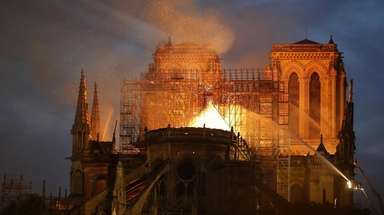 In the past few years, the celebrations were marred by violence. Two young people, one in his teens, were shot to death in the hours before the parade in 2016. Two others were wounded. In 2015, two people were killed during the celebrations, including Carey Gabay, a lawyer with the administration of Gov. Andrew M. Cuomo. To enter the parade route this year, people had to pass through metal detectors at one of 13 secure entry points — up from 12 last year — to be screened for weapons and alcoholic beverages. Backpacks and other large bags were prohibited. The NYPD late-Monday afternoon had no information on arrests stemming from the parade. Doris Payne said despite the past violence, the parade is a good opportunity for youth to express themselves before school begins.